Artograph 225-365 - LightTracer Light Box 10"X12"
The LED LightTracer now shines with dazzlingly bright LEDs. With maintenance-free gradient illumination from 5000 to 14,000 lux across the slanted surface, these LightTracers are the brightest light boxes available. 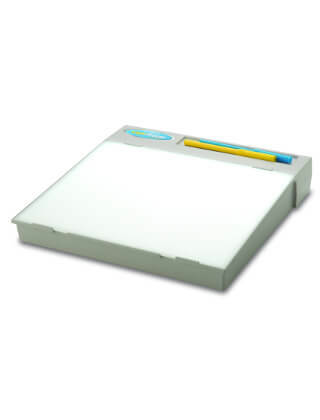 Features a 10 x 12 inch (254 x 305 mm) conveniently slanted lighted surface and handy recessed tool tray to keep pencils, chalk, embossing stylus, and other tracing tools at your fingertips. Illuminated by maintenance-free, cool, bright LEDs with a sleek new design.